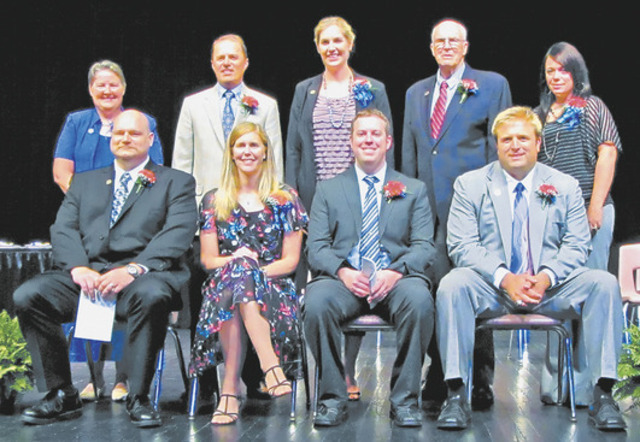 WOOSTER — One would expect to come to a hall of fame induction ceremony and listen to a long list of accomplishments of the honorees. That was the case at the 2012 Wayne County Sports Hall of Fame ceremony held at Wooster High School Saturday night. Nine new members were inducted in the 19th biennial class of the WCSHOF, bringing the total number of enshrinees to 188 since the charter class was honored way back in 1976. However, in addition to learning about the incredible array of athletic accolades of new WCSHOF members Scott Burnett, Jill McCreary Dilyard, Jacob Frank, Drew Gerber, Anita Jorney-Gifford, Scott Nye, Julie Paolano Solis, Dale Weygandt and Erin Iceman Wilson, those in attendance at the WHS Performing Arts Center also came away with many secrets of their success. In listening to the words of the presenters, and even moreso the inductees, they revealed how they came to rank among the greatest athletes and coaches in area sports history. Words such as dedication, hard work, teamwork, perseverance, adapting and thank you were repeated over and over. One of the biggest reasons the nine inductees were able to merit one of the biggest individual honors of their careers was because they learned how to be a part of a team. Gerber, a Wooster High graduate who went on to play football on two national championship teams at Youngstown State, said thank you to and named all the coaches he had in football and track, right down to longtime Generals equipment manager Bob Platt. “I broke my ankle my junior year in the Wooster-Orrville game and because coach Platt taped it up I was able to play two more quarters,” said Gerber, drawing laughs from the crowd. “Then, my senior year coach Platt taped my knee up after I blew it out (in practice) and I was able to play against (Massillon) Perry and there’s no way I could have played in that game if not for him. It was a big night for Wooster High products as four former Generals standouts and a former coach were honored. In addition to Gerber (presented by track coach Brian Questel), also inducted were Dilyard (presented by her father, John McCreary), Erin Iceman-Wilson (presented by coach Jorney-Gifford), Scott Nye (presented by Wooster Country Club golf pro Gary Welshhans) and Jorney-Gifford (presented by former player and current WHS volleyball coach Jen Maibach Snowbarger). Iceman-Wilson advanced to somewhere even most of the other WCSHOF members never reached: NCAA national champion. She played for Penn State’s 1999 volleyball team that won the Div. I national title, and then worked her way up to becoming a captain as a senior. A valuable lesson Iceman-Wilson shared was that she never felt like she was the best athlete on her teams and that a high school summer coach seemed to doubt if she could play for Penn State. Nye played for a state champion Wooster High golf team, was a four-time All-American at The College of Wooster and is now the golf pro at Marion Golf Course near Philadelphia. His course will host the U.S. Open next year and is ranked as the seventh-best in the country. Burnett, a record-setting thrower in track at Triway and Ashland University, was presented by his sister, Tamera Burnett-Penny. The two-time state shot put champion and Div. II NCAA qualifier in college praised those who helped him develop as an athlete and a person. Frank was introduced by his brother, Josh Frank, a former baseball teammate at both Northwestern High and The College of Wooster. Two women who have served in that latter role, and made the WCSHOF based moreso on their coaching careers than playing days, were Jorney-Gifford and Solis. “I accept this award on behalf of all the assistant coaches and athletes I’ve had because I couldn’t have done it without you,” said Jorney-Gifford, who had a 243-64 coaching record in volleyball, and is now the WHS principal. The longtime WHS leader explained that it’s OK to spread the credit and let others help for the benefit of a team. Solis, who was presented by friend and former co-worker Erin A. Short, said her coaches shaped her into the person she is today: coach of two-time defending Div. I state girls basketball champion Twinsburg. “I know firsthand how under-appreciated coaches can be and I say ‘thank you’ to all my former coaches,” Solis said. Weygandt, who was presented by son Douglas Weygandt, was a baseball and basketball standout at Northwestern in the 1950s, who went on to become a successful coach. His son said his dad always stepped up when there was a need, whether it was getting a ticket booth put up at Medina High’s football stadium, working on the baseball field himself, or building his kids’ special dorm-room furniture in college. Dale Weygandt’s greatest achievement may have been bringing the well-known DARE (anti-drug and alcohol program) to Ohio. For anyone who went to the 2012 WCSHOF induction ceremony there were a great deal of things worth hearing. A blueprint for success not only in sports, but life was laid out. 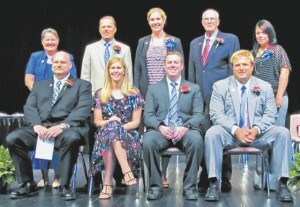 MORE HONOREES –Also elected to the WCSHOF in this class, but unable to attend were former Chippewa and St. Peter’s basketball star Sue Porter and Orrville High’s all-around athlete and Western Michigan quarterback Tim Hiller. Both plan to be inducted as part of the Class of 2014. The WCSHOF last night honored the 2012 Outstanding High School Seniors, Youth Service Award winner Tom Montelione and state champion Norwayne football and Waynedale wrestling teams. The Outstandings Seniors were Central Christian’s Julie Sleutz, Isaac Haver; Chippewa’s Amanda Richmond, Nick Vasilatos; Dalton’s Audrey Metzger, Seth Troyer; Kingsway Christian’s Jarrod Caskey; Northwestern’s Savanah Moore, Brett Fortune; Norwayne’s Kaitlin Howard, Adam Wallace; Orrville’s Maggie Johnson, Drew Brenner; Rittman’s Crystal Barber, Lance Horner; Smithville’s Tara Schaffter, Paul Kelbly; Triway’s Abby Strock, Eddy Grenert; Waynedale’s Megan Orr, Zeb Beam; and Wooster’s Samantha Murphy and Cody Neidig.